At Impact Trophies & Medals, we offer a huge range of flasks and Tankards suited to any special occasion, event or competition. 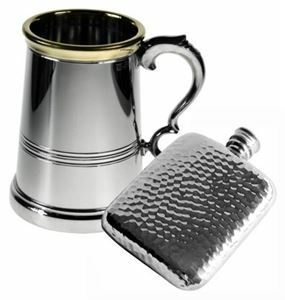 Our extensive range includes engraved metal tankards, engraved flasks and glass tankards for engraving. Impact Trophies & Medals are a leading retailer of tankards and flasks. Great for personalisation, many of our glass tankards and metal flasks can be personalised with high quality text and logo engraving, to perfectly meet your event and presentation needs. The Footed Beer Glass 0.4ltr is a high quality clear beer glass standing on a wide base with a short stem. 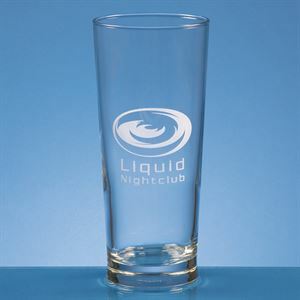 This premium quality glass has straight sides perfect for personalised engraving. Suitable for as a presentation piece or simply as a gift, we can personalise your Footed Beer Glass with text and logo engraving to meet your needs and present it in an optional satin lined gift box for a special touch. 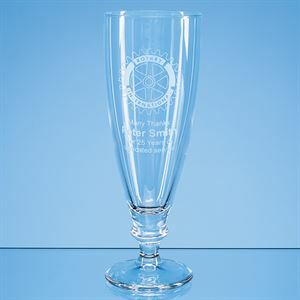 The Footed Beer Glass 0.4ltr can be purchased with or without personalised high quality engraving. The Small Mancunian Tankard 0.27ltr is a high quality simple clear glass tankard with a slightly curve base and large thick glass handle. The smooth face of this superior tankard offers a large space perfect for displaying personalised engraving. Suitable for displaying your choice of text and/or logos, this premium Mancunian Tankard can be personalised to make it suitable for a professional presentation or personalised gift. Supplied in a standard skillet box, alternatively a satin lined presentation box can be purchased for an extra special touch. The Small Mancunian Tankard 0.27ltr can be purchased with or without personalised high quality engraving. The Straight Sided Beer Tankard 0.29ltr is a high quality clear glass tankard with a rectangular handle. This small glass tankard stands on a thick glass base with rippling detail. 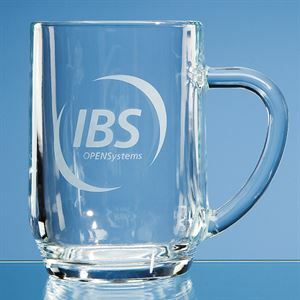 The face of the Straight Sided Beer Tankard offers ample space for quality glass engraving, allowing for the addition of text and logo personalisation suitable for a personalised gift or corporate presentation. This Straight Sided Beer Tankard is supplied in a FREE standard skillet box, or for a special touch a satin lined presentation box is available. 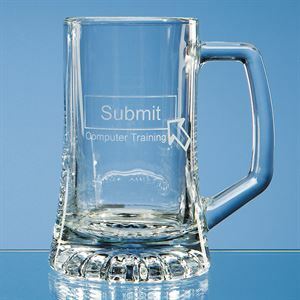 The Straight Sided Beer Tankard 0.29ltr can be purchased with or without personalised high quality engraving. Made from premium quality clear glass, the Harmony Beer Glass 0.385ltr is a superior quality beer glass with a conical shape and stem. This high quality beer glass stands on a wide footing, with a short ribbed stem for an easy grip. The body of the Harmony Beer Glass can be personalised with our high quality glass engraving, allowing the addition of personalised text and logos to be engraved onto the surface of the glass. A standard skillet box is supplied with the glass, alternatively a satin lined presentation box is available, creating a special touch. 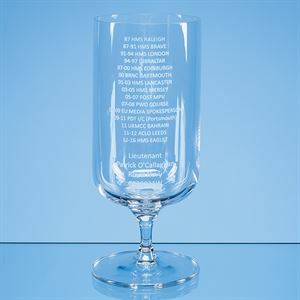 The Harmony Beer Glass 0.385ltr can be purchased with or without personalised high quality engraving. Made from high quality clear glass, the Curved Plain Tankard 0.45ltr is a simple curve sided tankard with a capacity of 0.45 litres. Standing on a thick glass base, the tankard has a large curved handle for ease of use. This premium quality tankard offers a large smooth surface perfect for us to add your choice of personalised text and logo/emblem engraving, making this glass perfect as a personalised gift for any special occasion. 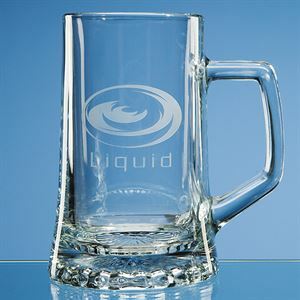 The Curved Plain Tankard 0.45ltr can be purchased with or without personalised high quality engraving. The tankard comes in a standard skillet box which can be upgraded to a satin lined presentation box for an extra special touch. The Large Straight Sided Beer Tankard 0.7ltr is a superior quality thick glass tankard with a rectangular handle. This superb glass tankard has a large capacity, with a thick glass base and straight sides perfect for engraved personalisation. 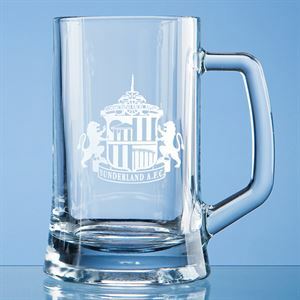 The face of the Large Straight Sided Beer Tankard can be engraved with high quality glass engraving, displaying your choice of text and/or logos allowing this versatile glass tankard to be tailored to meet your needs. The tankard comes in a standard skillet box, however, for a premium presentation an optional satin lined gift box is available to purchase. The Large Straight Sided Beer Tankard 0.7ltr can be purchased with or without personalised high quality engraving. The Small Plain Straight Sided Tankard 0.395ltr is a simple straight sided tankard with a thick glass handle. Set on a deep clear glass base, this superior quality tankard has a large space on the body of the glass for adding personalised engraving. This simple and sophisticated glass tankard is supplied in a free skillet box, alternatively a satin lined presentation box can be supplied, creating a wonderful gift. 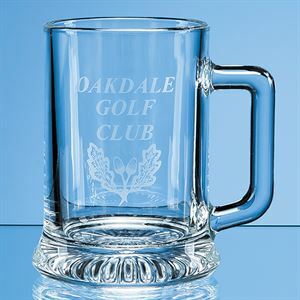 The Small Plain Straight Sided Tankard 0.395ltr can be purchased with or without personalised high quality engraving. Perfectly sized for half a pint, the Small Stern Tankard 0.287ltr is a traditional stern style tankard with a thick glass base and a round, ergonomic handle. The wider conical base leading up into straight sides. 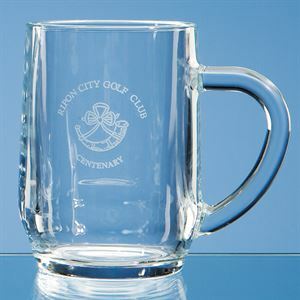 The face of the glass can be personalised with your choice of text and/or logo engraving, making the Small Stern Tankard 0.287ltr perfect for a professional or club presentation as well as a superb birthday gift. For a professional finish a satin lined presentation box is available. The Small Stern Tankard 0.287ltr can be purchased with or without personalised high quality engraving. The Large Plain Straight Sided Tankard 0.67ltr is a large glass tankard made from the finest quality clear glass. This superb clear glass tankard has a thick glass base and a rounded glass handle. 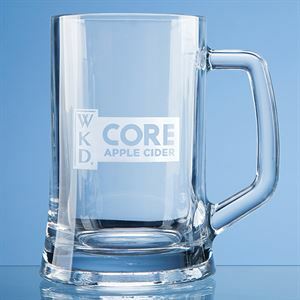 This simple glass tankard has a large straight side, with a large space for adding personalised text and logo engraving. The addition of engraving is the perfect way to tailor this glass to meet the needs of any occasion and the addition of a satin lined presentation box would create a memorable gift. The Large Plain Straight Sided Tankard 0.67ltr can be purchased with or without personalised high quality engraving.